Are you ready to nurture yourself and grow or reshape your business? 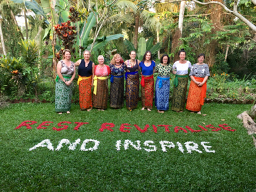 We can’t wait for you to join us in Bali for the practitioner experience of a lifetime. Read more about our 2019 retreat. Your total cost for the retreat varies, depending on the accommodation option you choose. 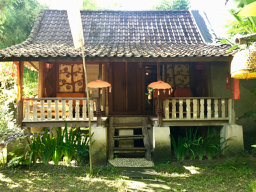 All cottages and deluxe rooms are uniquely decorated and designed, and include air conditioning, fans. Mosquito nets and a private bathroom. Fresh tea and coffee is delivered to your door each morning. There is free Wi-Fi onsite. Cottages: are constructed from recycled, eco-friendly material and include one double and at least one single bed. They’re spacious, and most have a semi-outdoor private bathroom with shower. All cottages have a veranda with day bed, in are situated separately in a beautiful garden setting. Deluxe rooms: are also are unique in their shape, views and design, and have their own terrace. Rooms include a double bed and a bathroom (most with bathtubs). Each cottage contains one double and up to two single beds. Due to room and bed configurations, we suggest this is only an option for friends who wish to share. Both people must apply at the same time in order to apply for this option. There are only a couple of cottages designated for sharing and may sell out fast. As accommodation is strictly limited you may not get your first choice, Rooms and cottages will be allocated in the order that applicants are accepted, and payment received. It’s important that on applying you commit to a first and second choice. Have you been to Bali before? You might have noticed that the streets and traditional buildings can be quite different to home. The resort has a number of steps down from the road and to access to all the accommodation. 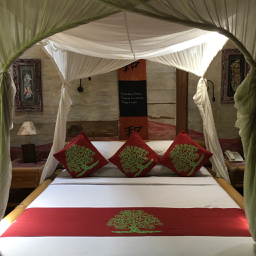 We work in a covered, open air traditional shala, sitting on chairs, mats or cushions. Unfortunatly. this is not a wheelchair friendly environment. Please contact us, if you have any disability to discuss suitability. The retreat is only for participants. This is a very special time for you to take time out of your busy work and home lives, and invest in self-care and business mentoring. Therefore, non-participants cannot informally join the retreat or share rooms etc. The retreat is an immersive experience, so there’s not a non-residential option. We want you to have the best experience possible and get the most out of the process, so it helps that we know a little bit about you and what your seeking. It’s also important that you understand and agree to the commitment and conditions. Arriving at the retreat no later than 2 pm on Monday 17 June. Participating in all daily workshop and reflection sessions. Note: the end time on Saturday 22 is approximately 1.30pm but please don’t plan to leave before 2pm. If flying that day allow up to 2 hours for the drive to the airport, plus the airline’s recommended check in time. Being present, please don’t commit to outside activities during the retreat. Please note, prices are in AUD when paid by Australian bank transfer. A reminder that your $500 deposit is non-refundable (unless the event is cancelled). The organisers reserve the right to cancel the retreat without indemnity. If this happens, your deposits will be refunded in full. Depending on your professional association, our business development and mentoring content is applicable for a minimum of 20 hours continuing professional education. The retreat, costs associated with travel, insurance and some discretionary expenses are tax deductible when you own your business. Please consult your accountant for further details. 2019 rest revitalise inspire – download the application form and apply now! To stay in the loop, please marked “interested” on our Facebook page, we look forward you to changing your status to “going” when you’ve applied! We’d love you to be part of Rest, Revitalise & Inspire in 2019. 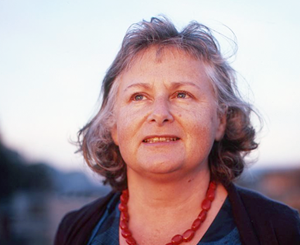 This is our third practitioner retreat, but we can’t guarantee there will be more. Please don’t miss out.